The Best Wheel, Rim, And Tire Kit combines the best products and accessories to clean, shine, and protect OEM and custom aftermarket wheels. 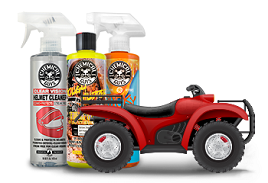 Start off by diluting Diablo Wheel Gel into the included Professional Sprayer Bottle and then spray an even coating over the entire wheel and face to lift and lubricate abrasive dirt, grime, and brake dust. Have thicker brake dust? 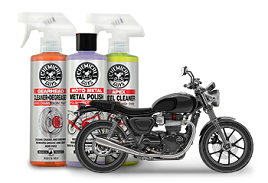 Cut through the grime with Signature Series Wheel Cleaner! The tough blue formula breaks down thicker dirt and sticky oil stains so they easily come apart with a couple passes of the included brushes. 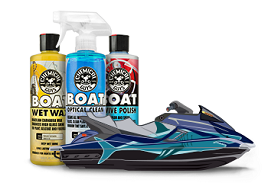 Best Wheel, Rim, And Tire Kit ships with two professional-grade brushes for thorough cleaning on any part of your wheels and rims. Scrub in between the spokes and deep into the body of the wheel with the new Show Car Wheel & Rim Brush, and remove all that brake dust and grime that has just been out of reach all this time. Finish by cleaning the face of the hub, spokes, rim, and tire with the extra-soft Body & Wheel Flagged Tip Brush. Lay down a coat of Max Coat Wheel Guard to repel future pepperings of brake dust and make wheels easier to clean, and restore a rich black shine to tire sidewalls with V.R.P. Super Shine Protectant Dressing. Skip all the questions, hours of pondering, and dollars experimenting on the best wheel-cleaning regimen: pick up the Best Wheel, Rim, And Tire Kit and get it over and done with so you can go drive your car already!